Working out what salary you should be offering in order to attract the best talent can be difficult, especially for new founders. That's why we've created a salary calculator to do the work for you. At ACELR8, we're not only recruiters, but also consultants. As part of this, we often get asked for advice by both clients and candidates on matters such as salary. We realised that there was no accurate, reliable resource available on the internet providing this information, so we decided to create our own. 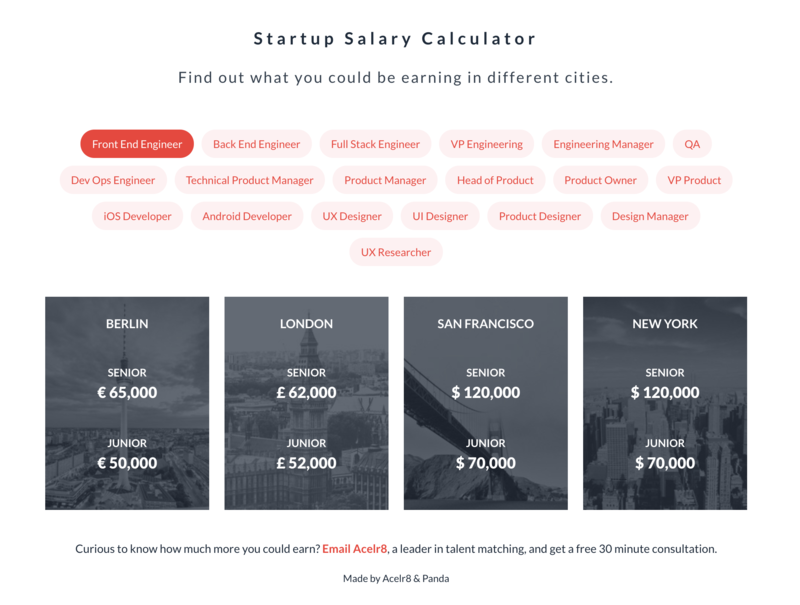 ACELR8's salary calculator takes into account the seniority of the candidate, and gives the market rate currently being paid for candidates across various product, design, and engineering functions in four cities: Berlin, London, San Francisco, and New York. Although our caclulator accurately reports the average market rate currently being paid, it is important to remember that rates will vary in accordance with the stage of the startup, the amount of funding it has, and the amount of equity or other benefits being offered alongside the basic salary.